Make It Count: The Life and Times of Basketball Great JoJo White autographed by Mark Bodanza. Historian and trial lawyer Mark C. Bodanza, narrates the compelling chronicle of a sports career complete with drama, triumphs, and losses, as well as an affirmation that hard work has its reward. In life, as in basketball, JoJo White’s approach to each opportunity that a new day presents has always been the same: make it count. White’s story is interwoven with ours as a nation. His basketball days were shaped by-and in a few cases, helped shape-events of monumental importance. Race relations, the war in Vietnam, and political tumult across the land punctuated White’s years as both a Kansas Jayhawk and Boston Celtic. Bodanza shows how, through his years on the court, the point guard from St. Louis, Missouri, maintained a steady contribution to the game that became his passion while still a child. With each passing game, season, or team that formed a part of his playing days, White stayed true to principles learned before he donned his first high-school uniform. 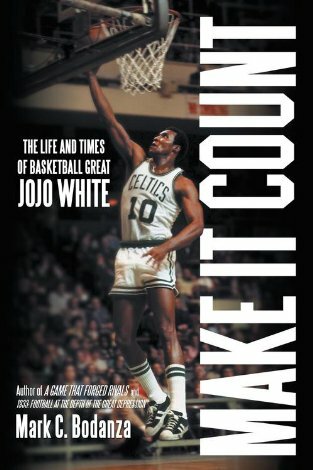 Order your copy of Make It Count: The Life and Times of Basketball Great JoJo White today!